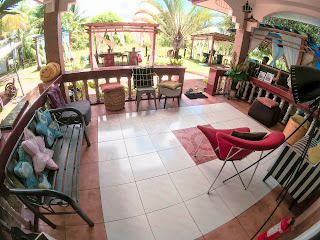 2 days and 1 night in Bohol? Yes, you read it right! For just 2 days, me and my favorite persons were able to explore Panglao island. Even though we’re not able to go to the famous chocolate hills, we had an awesome getaway. We took the earliest trip from Cebu via Oceanjet ferry going to Tagbilaran port. It was 5:10am and a lot of people surprised us (bcoz who would have thought that there will be a lot of passengers at that moment). We arrived at Tagbilaran around 7am (2 hours trip). We took a tricycle going to Tagbilaran-Panglao terminal. We reached Panglao for 1 hour and we paid 25pesos each. 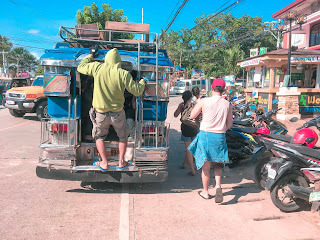 After we checked in, we rented a tricycle going to Dumaluan beach, 4kms away from the place we are staying. 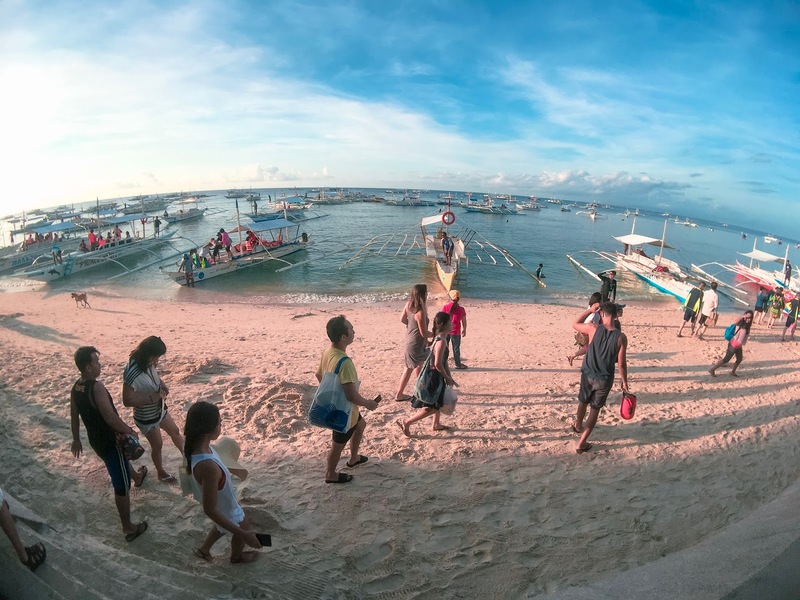 You may opt to go to the public beach where you’ll only pay 25pesos for the entrance fee or to the private beach. At 4pm, we went to Alona Beach, one of the famous beach resort in Panglao with many hotels, restaurants and bars. At night, we’ve decided to chill out at the bar we passed by going to Alona Beach. Second day in Panglao. We woke up early to do island hopping which started at 6am, where we joined some people in one boat that only cost 400 pesos. First, we headed to a place in the middle of the sea where we chased the amazing dolphins. 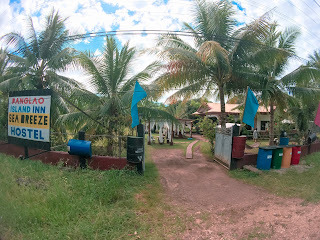 Second, we went to Balicasag Island, circle in shape and contains a village where tourists can taste local foods. There they offer snorkeling and chasing turtles activities which you will pay less than 1,000 pesos for the two spots. Me and my friends have decided not to avail those activities but to explore the island. Third, but not the least, we headed to Virgin Island of Bohol. This island is just after the Panglao Reef Flat. 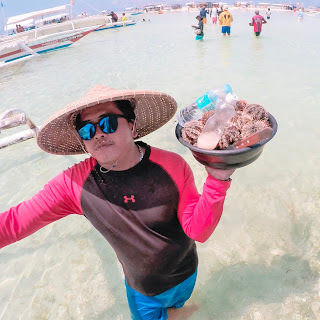 Upon reaching the island, we saw some vendors selling seashells and sea urchins. 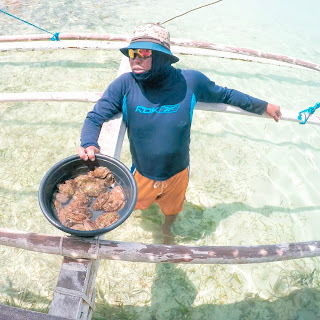 On the sand, locals occupied the area with them selling and cooking seafoods and that’s what they called Seafood island. The sand wasn’t as fine as I expected but ‘twas worth it. You can see a lot of star fishes lying on the sand and some small fishes🐟 playing around. If you're more adventurous than us, they also offer kayaking, jet ski, kitesurfing and scuba diving. Before heading home, we just had a good time swimming on the azure beaches of Alona and the beachfront of Henann Resort. The weather was so nice and we enjoyed chasing the big waves. I was so grateful that this trip to Bohol came true. As what my friend Kaize said, "drawing plans no more". Yes! We both planned this trip 1 and a half years ago. We made so many happy memories together and also with other colleagues. I am going to share with you some of it. Our visit in Bohol wouldn't be completed if we don't try their famous Bohol Bee Farm Ice Cream. It was only 60pesos per scoop and is so worth it. Will probably try different flavor next time. At the end of our trip, we learned that time is really important. We don’t need to worry about the things happening around us. We need to make out the best and live like there’s no tomorrow. From Cebu, take a taxi going to Pier 1 (uno) or take the 02B jeepney if you are not in a hurry. Go directly to OceanJet ticketing office. Ticket costs 450 pesos(open air) or 500 pesos(tourist class) from Cebu-Tagbilaran. 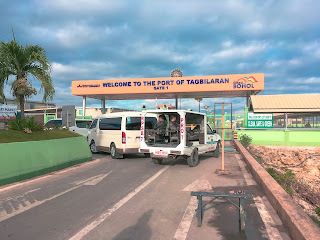 From Tagbilaran Port, you may hire a tricycle going to Panglao which ranges from 250-300 pesos or ride a tricycle from Tagbilaran Port going to Tagbilaran-Panglao Terminal. Just say to the conductor(the one collecting the fare) to drop you off to the beach you are heading to. The jeepney fare is 25 pesos. There are so many tricycles around Panglao. 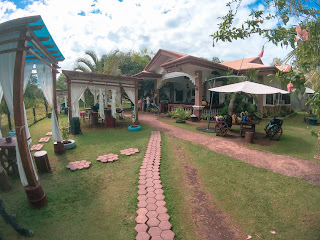 To avoid being ripped off, ask the receptionist of your hotel on which way is the best or how much it cost to ride a tricycle or you may consult to their Tourism office just near Alona Beach.